Graves Motorsports 2017-2019 Honda CBR10000rr Titanium Cat Back Slip-on Exhaust System with Carbon 200mm silencer. GMS Exhaust systems are designed for the elite rider seeking top of the line performance, fit, finish and value. 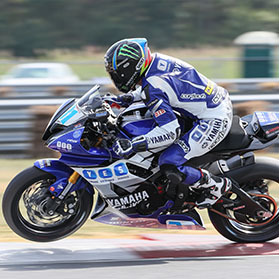 This CBR exhaust system was developed using the same technology that has powered Graves exhaust systems to 7 straight consecutive Moto America / AMA Superbike championships along with numerous 600cc titles. This product retains the OEM catalytic converter system. Scroll down for sound and installation videos. New Diamond Shaped Silencer Design (Carbon Fiber with Titanium End Cap) designed to match the CBR's body line. 1 Auto Tuner Style Lambda sensors comes.